When Joseph Cobbs III heard that the store he bought tickets from had sold a winner, he had a hunch that he had hit the big time. But when he called his fiancee Kendra Batts, she could not locate his ticket for the Nov. 9 draw of the Carolina Cash 5, so he headed home to find it. 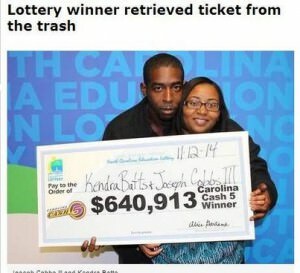 The prize must have been really meant for them, because he easily found the lost ticket among the trash. They later turned up at the lottery offices to claim a $640,913 jackpot. They split the winnings so each received $221,756 net of state and federal taxes. Now the couple are looking for a new home.